Curve studied by Jacques Bernoulli in 1694 and Fagnano in 1750. Jacques Bernoulli (1654 -1705): Swiss mathematician. Bipolar equation: (where d is the half-distance between the poles F and F', foci of the lemniscate). Tripolar equation: (O middle of F and F'). Polar equation: (with , F(d, 0), F'(-d,0)). hence the complex parametrization: . Another Cartesian parametrization: ( ). 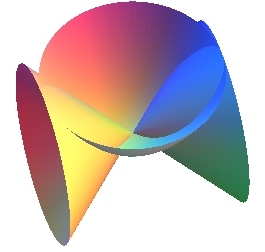 Cartesian parametrization of the complexified curve: . Length: , where , elliptic integral of the first kind, is the constant of the lemniscate (variation of the letter "pi"), to relate to . We also have: . Total area: a2. The lemniscate of Bernoulli is a challenger, along with the cardioid, for the record number of memberships to various families of remarkable curves. - a special case of Booth curve. 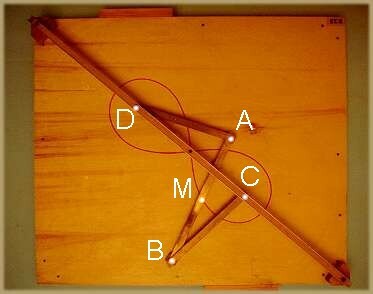 - as all rational bicircular quartic, at the same time, the pedal with respect to O and the inverse (reference circle with diameter [A(a,0) ; A'(-a,0)]) of the rectangular hyperbola with centre O and vertices A and A'; F and F' are the inverses of the foci of this hyperbola and the tangents at the origin are the inverses of the asymptotes. - it is also, as a pedal curve, the envelope of the circles with diameters the ends of which are the centre and a point of this hyperbola. - as well as the locus of the centre of a hyperbola rolling without slipping on an equal hyperbola, with coinciding vertices. - the cissoid of the circle with centre F passing by O and the circle with centre and radius a. - the cissoid with pole O of the circles (C) and (C') with centres F and F' and radii a/2. In dotted lines, the circles (C) and (C'), in blue their homothetic image, the median of which is the lemniscate. - the locus of the middles of segment lines of length 2d the ends of which describe two circles with radius a centred on F and F'. - the asymptotic curves of the Plücker conoid are projected on lemniscates of Bernoulli. The evolute of the lemniscate of Bernoulli is parametrized by . Generalisation: the pedal of the rectangular hyperbola with respect to a point on the symmetry axis is a distorted lemniscate, parametrized by . See here how to "thicken" a lemniscate: .